10'w display can be seen from far away. Transport cases protect equipment when in route to a trade show. Attachments create a packaged presentational display - no more having to bring multiple tables or shelves. Stretch cloth advertisements are pulled taut for a clear viewing of your message. Tubular framing View Setup Instructions in a few minutes. 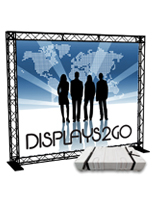 These trade show display booths are more than just backdrop banner stands. The floor-standing pop up exhibits are equipped with a counter and a literature rack to supplement a presentation with additional promotional tools. The laminate table easily attaches with the provided clip. 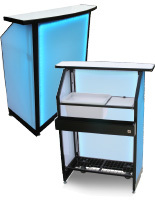 These trade show display booths can therefore be used to showcase a product or to offer guests refreshments. 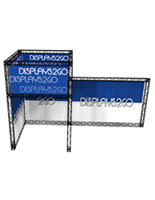 These tradeshow banner stands are also equipped with a brochure holder, which is arranged using standoffs. This maintains a floating design to which customers will be drawn. 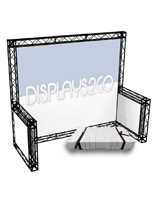 These trade show display booths are easy to set up and do not require any additional hardware. These tension fabric pop up exhibits merge banner stands with a pamphlet rack, composing a more inviting tradeshow demonstration that moves presenters out of the cubicle-like settings. 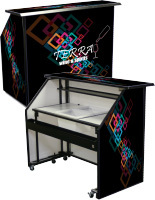 These trade show display booths are made up of an aluminum frame that assembles with a snap of button. Each tube connects as a group, forming the entire curved structure. The next step is to simply slide the printed graphics overtop and zipper the material closed. 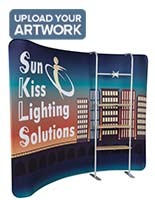 These portable trade show display booths are provided with custom-printed stretchy fabric. 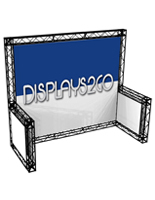 This makes your displayed advertisement smooth and more professional by eliminating wrinkles, seams and folds. The personalized images go through a dye sublimation printing process, creating 600 DPI prints that are both brightly-colored and detailed. These pop up exhibits can be transported to and from an event with ease. 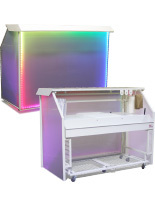 Two shipping containers are included so users are able to store supplies while traveling. The counter & literature rack can be positioned on either side. Please specify which side you'd prefer when placing an order. Please Note: The top and the bottom of the literature stand comes with printed graphics. 26.0" x 50.0" x 12.0"